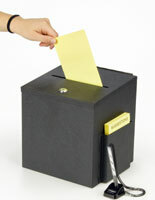 How can these metal ballot boxes benefit your business? 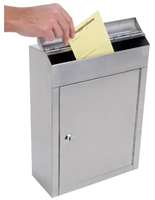 These large metal boxes provide customers with a locking container to drop keys, comments or payments. 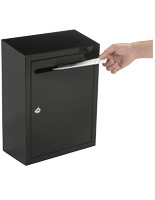 Guests checking out of hotels can place there card keys in the safe drop box on the way out, making checkout a quick and easy process. 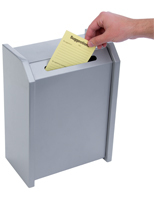 Metal key drop boxes can also help alleviate some pressure from the front desk, especially during busy periods where guests are checking in and leaving simultaneously. 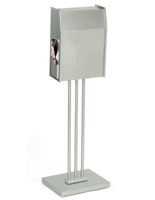 Most of these metal drop boxes can be used on countertops or as wall mounting units. 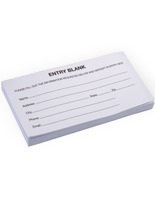 Also use these registration boxes to collect large volumes of information at a single time. 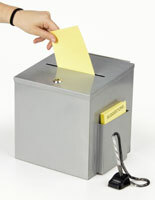 Restaurants are also a great place to implement a ballot box. 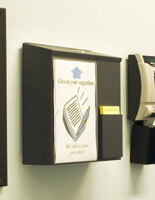 Attach a security pen to these displays so users have a space to write in suggestions and comments. 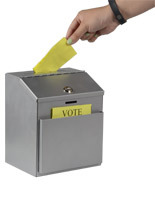 Hotels can greatly benefit from the use of ballot boxes. 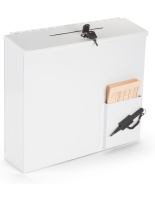 These locking displays have plenty of space and will hold large quantities of suggestion cards, ballots, ballot or tickets. 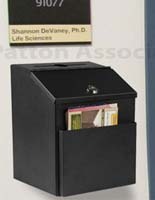 Some of the key metal boxes included in this category have space to place signage directly onto the box. 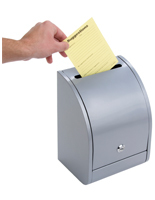 Label it so guests or aware of the purpose of your key drop box or opinion box. 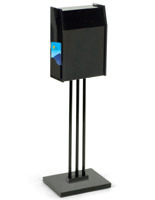 You can also display the business or hotel logo on the front for extra brand awareness. 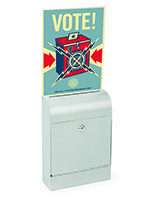 The locking mechanisms on these displays allow votes, money, and ballots to be kept secure. 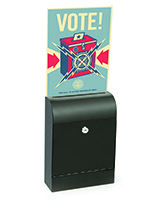 Place these directly in the lobby or up by the kiosk. 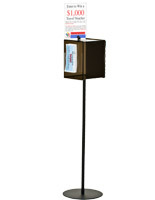 Provide guests with a quick and easy way to leave the hotel. 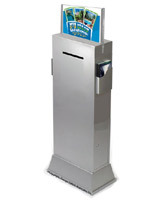 Guests will feel at ease as they can quickly drop off their keys and depart without having to deal with the hassle of long lines. 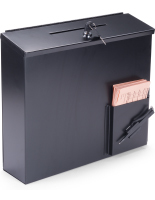 What are some of the features of these metal ballot boxes? 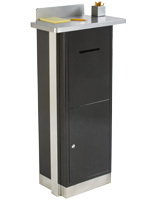 Many car service stations use these containers as well. These boxes can be left by the register for customers to leave keys when no one is at the service desk. Often times mechanics are busy working on vehicles and do not have time to meet with customers when dropping off a vehicle. 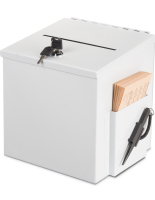 With a locking box at the register, customers can call ahead to schedule an appointment and simply leave their keys in the box when they drop off the vehicle. 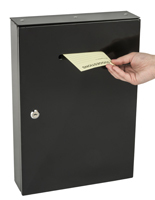 Attach this canister to the wall to help prevent any theft. 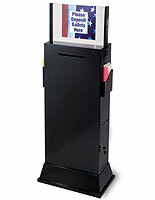 Wall mounted ballot boxes make it easy to put these units anywhere. 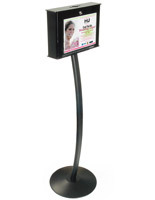 These displays feature screws to easily hang any display near a door or window. 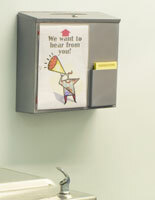 A wall mounting comment box can be hung outside of a business to effectively collect money or suggestions past regular operational hours. Some of these boxes come with foam padding. 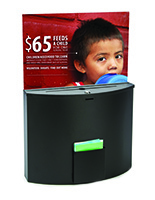 Use the foam padding as feet to prevent the fundraising box from sliding around or scratching any glossy surfaces. They can also act as buffers to prevent the wall from being scratched. 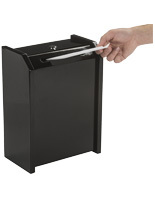 The security pens that are offered with most of these bins can attach directly to a wall, countertop, or the display itself. 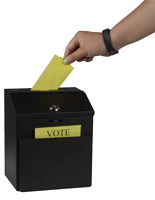 Use the graphics area on to provide information about an election or a promotion. If people are informed of what they‘re supposed to be writing about then the consumer is more likely to provide helpful information. 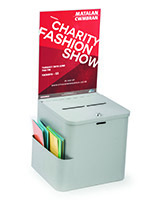 Many other suggestion and donation bins are available as well in the main donation and ballot bins category. 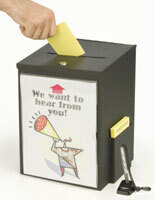 Clear acrylic boxes are effective for collecting money for charity, as people can see what has already been donated. 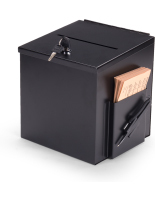 Most boxes feature a locking design to prevent donations from being stolen. 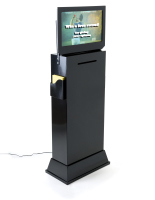 Looking to draw in more people at trade shows and carnivals? 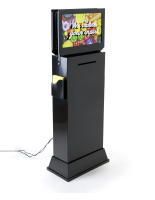 Try bingo sets, prize drop boards and prize wheels. 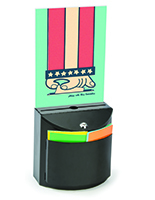 Game wheels provide a fun way for guests tradeshow visitors to get involved and have fun, not to mention win some prizes and giveaways. 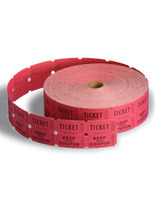 We also offer raffle drums! 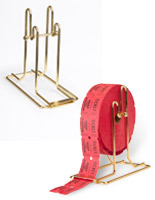 Draw prize winners in a fun way! Use these drums to pick sweepstakes and 50/50 winners. 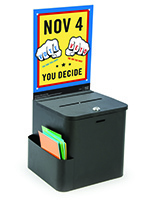 Many of these fun displays are portable and can be easily taken on the road to use in a variety of different settings.